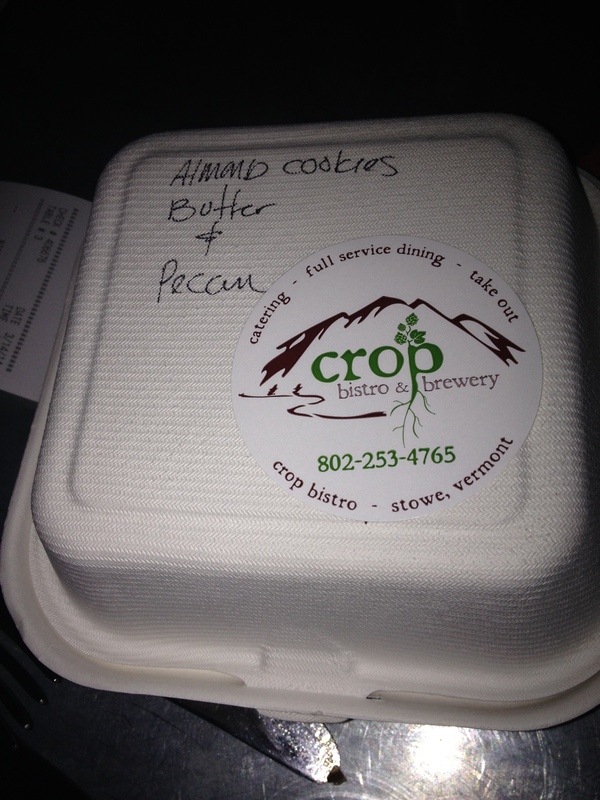 Crop Bistro and Brewery, Stowe Vermont – Breweries, Wineries and the fun in between! 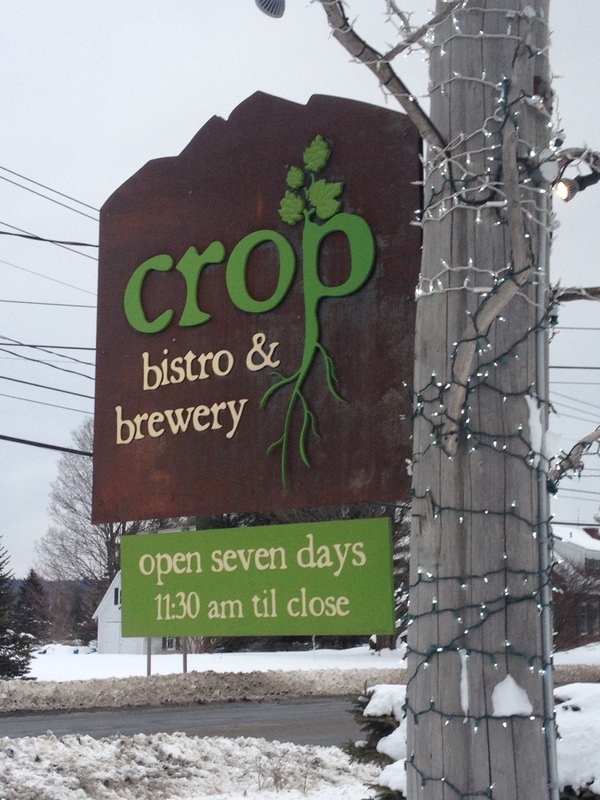 While visiting John and Lindsay, we went for dinner and beer at Crop Bistro and Brewery, located in Stowe, Vermont. 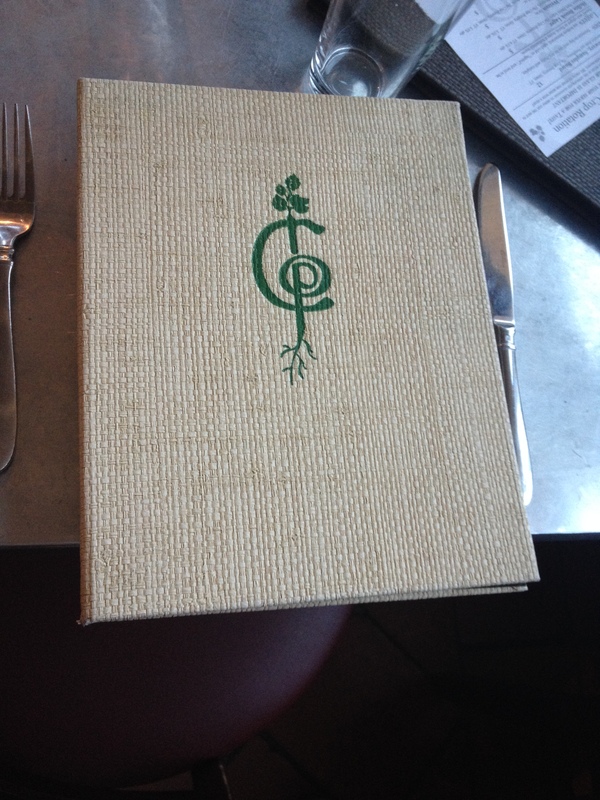 Crop Bistro is a farm to table restaurant, and on their website have a list of the local suppliers they use. 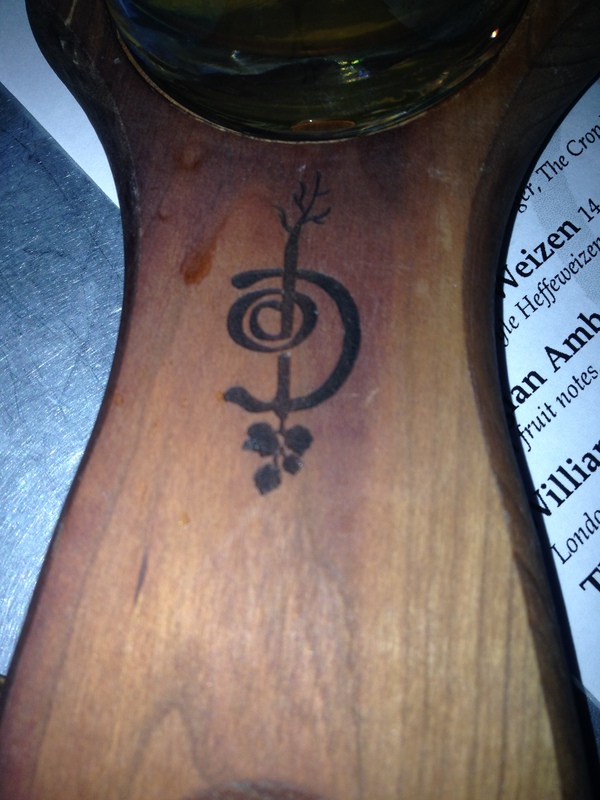 The beers were first on tap in January 2013. They have just started selling kegs locally, so they are growing. 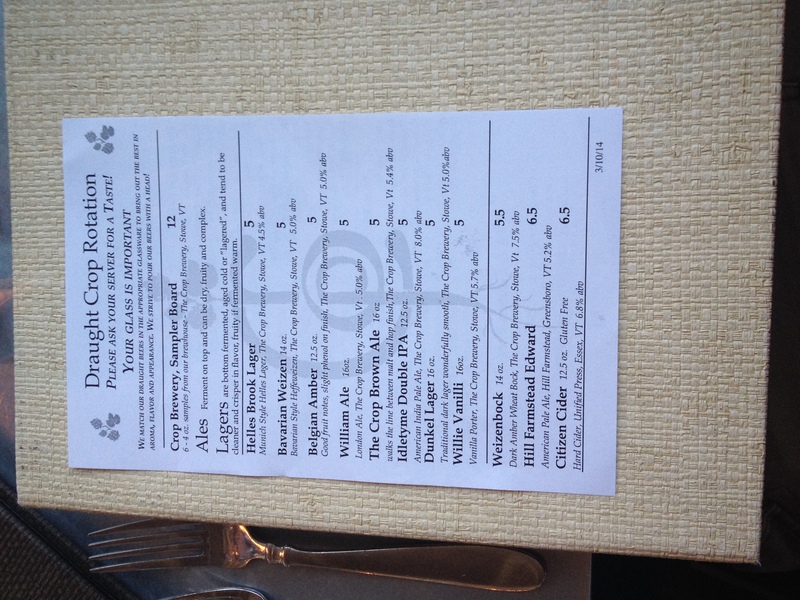 Slightly expensive, but like you would expect from a nice restaurant, certainly not your typical Brew Pub. 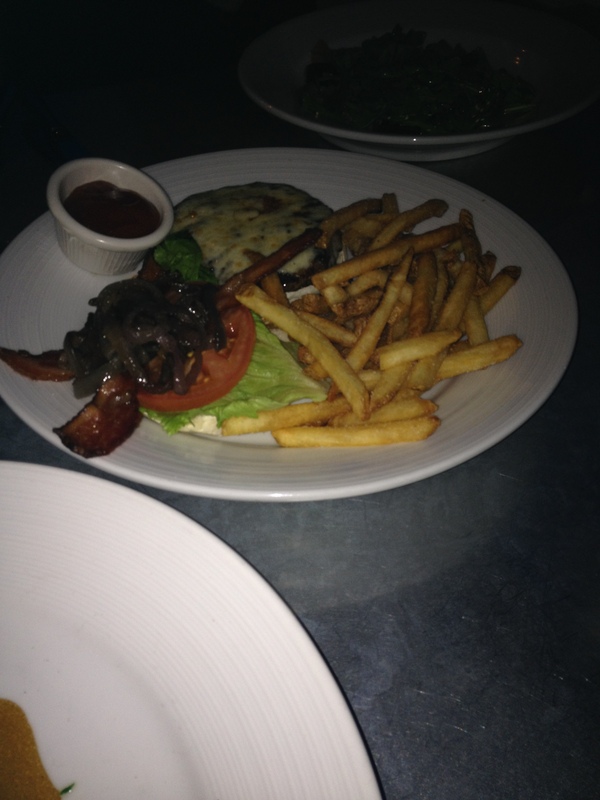 The food was good overall. 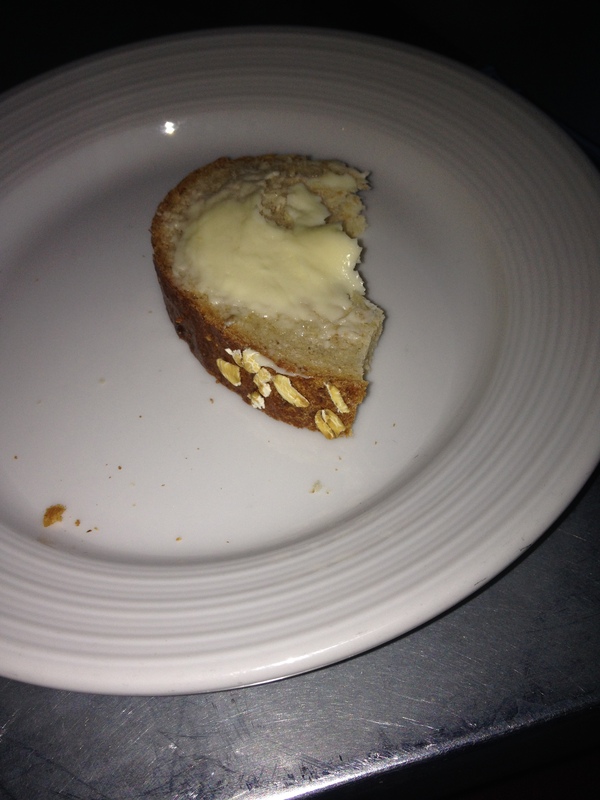 The bread was slightly sweet with a good flavor, soft and fresh. We ordered 3 apps, Rip N Dip, Fried Pickles, and Potato skins. Everyone liked the Rip N Dip, good flavor, like a tomato fondue, had chili powder on top- so don’t get too much of that on one chunk of bread! 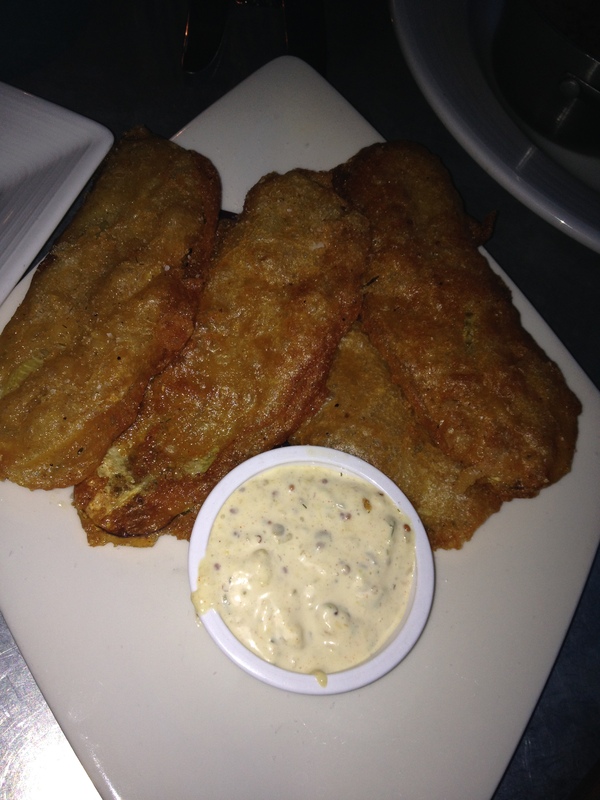 Fried pickles were cut lengthwise, salty, lots of batter, Megan thought a little too much batter. 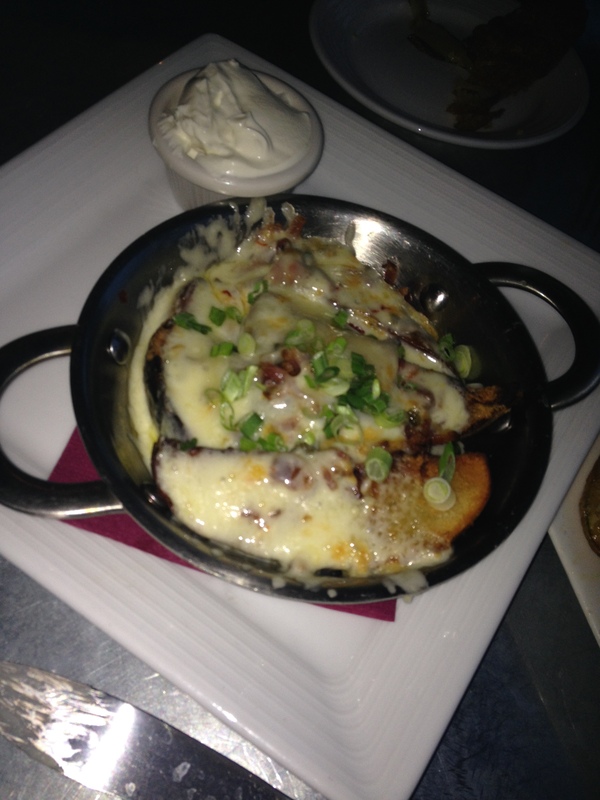 Potato skins were fancy, cut, covered in cheese in a saucepan. Crop says they match the glass to the beer to bring out the best aroma’s, flavor, and appearance. They ‘strive to pour our beers with a head!’ Also on the beer menu it says the ales ferment on top and can be dry, fruity, and complex. The lagers are bottom fermented, aged cold or ‘lagered’ and tend to be cleaner and crisper in flavor, fruity if fermented warm. 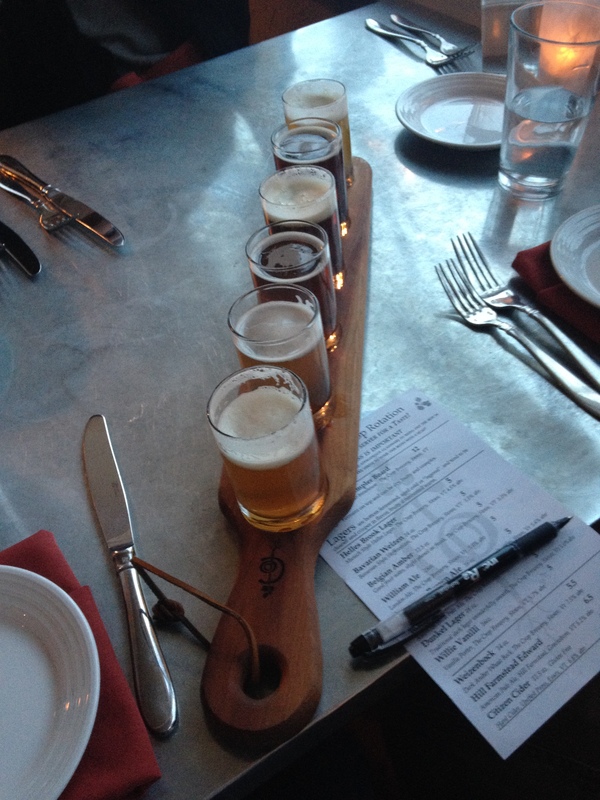 We ordered The Crop Brewery Sample Board. We thought we got to order the beers we wanted since it did not say on the menu, but when I asked the waitress she rudely told me no. A little sweeter than normal. Lager taste with medium body. Megan thought it tasted slightly like bananas, I only got that smell. 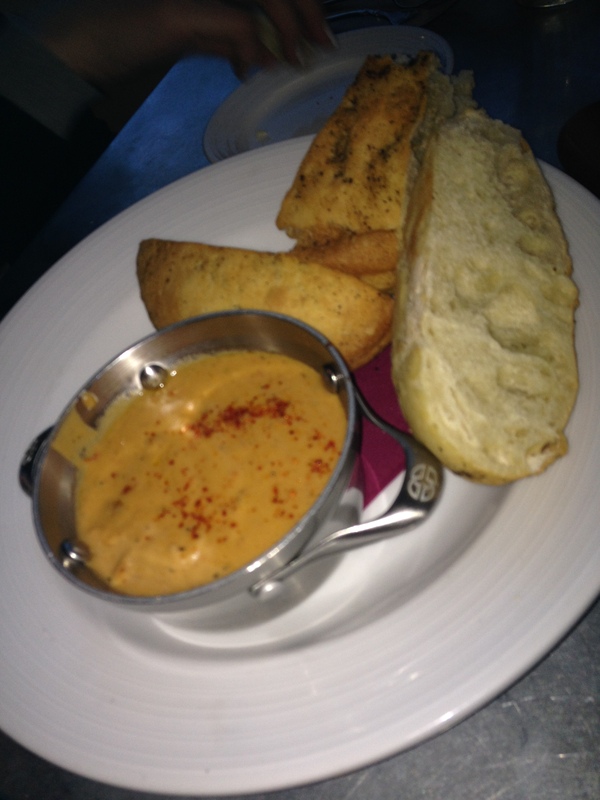 Was not overpowering, a little bit of a slightly odd/ spicy flavor. Smooth, reminded Megan of fresh bread flavor. Creamy flavor, like other English ales I have tried recently. Fairly light flavor. Has a richer flavor than other brown ales, still fairly light flavor. Since it was not included in the sample board I ordered a pint of the Willi Vanilli. Megan thought tasted like ice cream, I got more of a sweet, dark porter taste. The beer was definitely good. Very traditional beer styles. 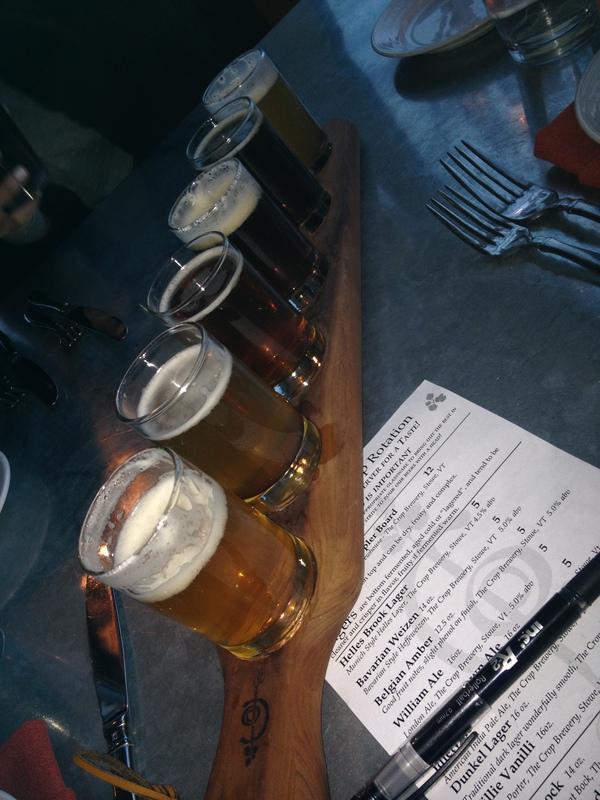 They have a lot of other local beers on tap as well, and some of the big name beers for people who are not interested in trying something new. They sell Growlers and Bombers to go. The Bavarian Weizen and Willi Vanili have been rotated out for a Maerzen Lager – a German style march beer, and a Vermont Pale Ale with some homegrown hops. 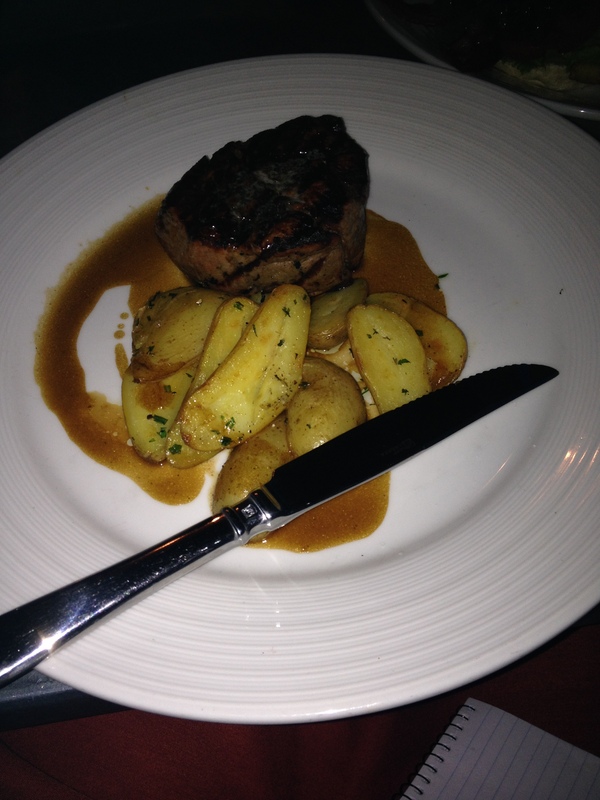 Megan had the Beef tenderloin. It was cooked nicely, juicy. 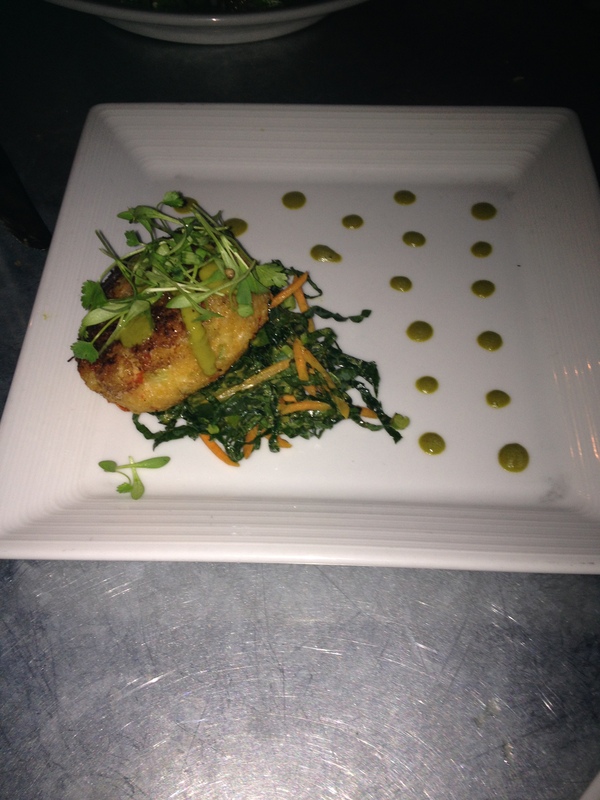 Lindsay ordered the Pacific Red Crab Cake, as well as a salad. She enjoyed this, but after the salad found it was too big to finish! 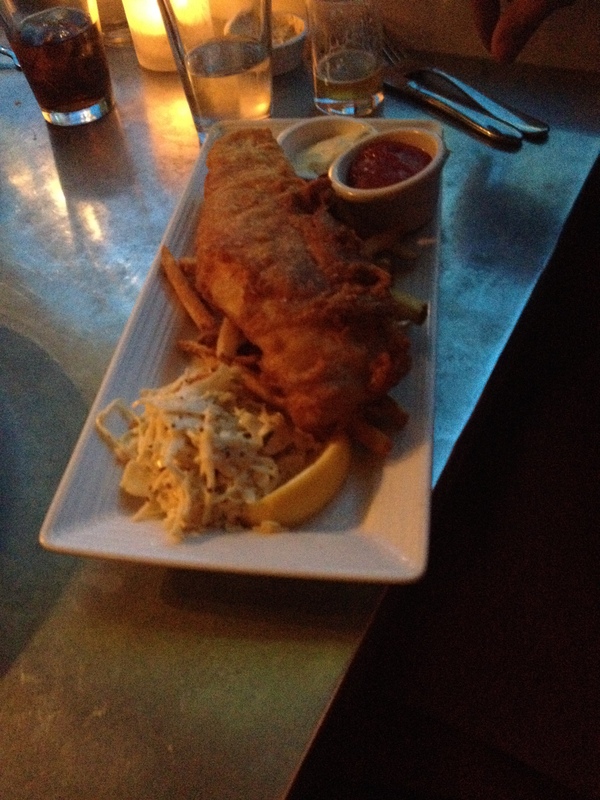 I ordered the Beer Battered Fish and Chips- the fish was HUGE and tasty and fresh. The fries were also good and tasty. The waitress seemed rude, not very talkative, not really ‘there’. She took our empty drinks and did not ask if we wanted anything else. John and Lindsay said that is typical in that area, or in Vermont in general. The room were sat in seemed strange, too. 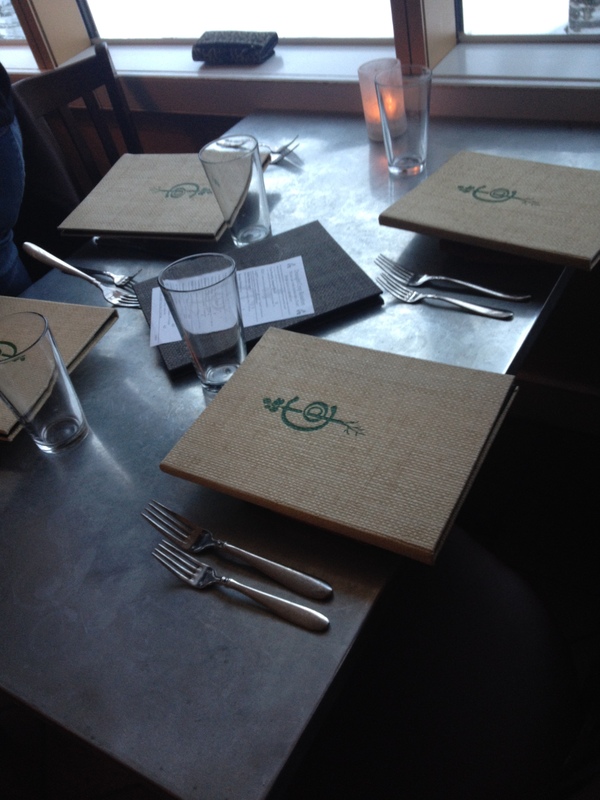 It was out in the back, seemed more like a brunch room with metal tables. The front room looked much nicer, had more lights, a fireplace, and more atmosphere. John and Lindsay have sat in the front room every other time they have been there, and said that the hospitality in that room tends to be better.